The bluejacket sat up in bed and grinned into the hand mirror. He was studying a new artificial eye just inserted by Navy doctors aboard the U. S. Navy hospital ship, USS Refuge. "Say, nurse, do you suppose they could give me an extra eye-one that's sort of bloodshot so it can match my real one just in case I'm out celebrating sometime?" He spoke in a kidding vein, but there is no certainty that, deep down, he wasn't in dead earnest. Wounded men have come to expect wonders aboard Navy hospital ships. The huge, modern floating hospitals of the Navy's mercy fleet bring the finest medical care known to man across thousands of miles of perilous waters to within sight and sound of bloody invasion beaches. They have helped make the Medical Department's slogan: "To keep as many men at as many guns as many days as possible," not just a catchword but an actual accomplishment. As a matter of record, more than 98% of all casualties brought aboard our hospital ships are saved. Results like this have accentuated the value of hospital ships for duty with the far-flung forces of our fleet. So, with the commissioning of six new ships during April, May and June of this year, our mercy fleet is being swelled to a total of 15 hospital ships, including three manned by Navy crews but staffed by Army medical and surgical men. The six new ships are the USS Tranquility, the USS Haven, the USS Benevolence, the USS Repose, the USS Consolation and the USS Sanctuary. They are known as the "Haven class" - first time in history the Navy has had a class of hospital ships. They are designed to be of maximum service in forward assault areas and will function not only as floating hospitals but also as medical supply ships servicing advance base hospitals and warships. Complete air-conditioning throughout both hospital and crew's quarters. Operating rooms located near the metacenter - the roll and pitch center of the ship where movement is at a minimum. Increased numbers of ladders and hoists to speed the handling of patients and stores. Optical repair room as well as a base optical repair unit. Enlarged storerooms totaling 85,000 cubic feet. Increased recreational facilities. For the first time, two Red Cross workers will be aboard with Red Cross supplies to assist in recreational work. This growing mercy fleet is a far cry from the dim days when wounded sailors were lifted from bloodied decks and tossed to the sharks-a time no more distant than the 18th century. "This cruelty was not prompted entirely by unconcern on the part of the officers, but by expediency - there was nothing else to do with a sailor in 1750 who became seriously ill in the mid-Atlantic or who, far from shore, was wounded in battle . . . Adequate care of the health of naval forces was an idea that developed slowly through the centuries. Now we know that the best medical attention we can give our men is not only humanitarian but it is practical, good sense. It prevents the spread of disease; restores men to the service who would otherwise be lost and it also maintains morale." 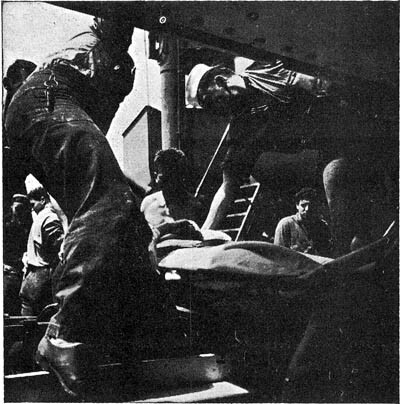 IN RENDEZVOUS at sea, wounded are transferred to hospital ship from transport. Hospital ships usually approach beachheads only in daylight hours. OPERATION is performed aboard hospital ship USS Solace to remove shrapnel from soldier wounded on Okinawa. WOUNDED MAN in Stokes stretcher is taken aboard Solace through port in hull from assault craft lying alongside. sent a hospital ship with Admiral Penn's fleet on a West Indian cruise in 1654. A short while later the French recommended that 100-bed hospital ships be assigned to the fleet - one to every 10 ships of the line. But hospital ships did not take their fully recognized place until 1854 when England used them in the Crimean War. British hospital ships brought 100,000 wounded back from the Black Sea conflict inside 22 months. ". . . I wish that you could see our hospital boat, the Red Rover . . . She is decided to be the most complete thing of her kind that ever floated, and is in every way a decided success . . . The ice box . . . holds 300 tons . . . She has bathrooms, laundry, elevator for the sick . . . operating rooms, nine different water closets, gauze blinds at the windows . . . two separate kitchens for sick and well, a regular corps of nurses and two water closets for every deck." At about the same time, the USS Idaho was converted into a hospital ship and assigned to the Asiatic Station. For two years she was anchored in, of all places, Nagasaki harbor, Japan. During World War I, the Navy operated three hospital ships called the Mercy, Comfort and Solace. At that time, there was an old saying in the fleet: "No mercy on the Comfort, no comfort on the Mercy, and no Solace on either." But, actually, they performed meritoriously and placed further emphasis on the growing importance of hospital ships. So much so, that, in 1917, the USS Relief, first ship ever built from the keel up for military hospital purposes, was designed and laid down. She was launched in 1919. She was the first to carry a complete field hospital unit for landing with an expeditionary force or setting up to aid in relief work in a civil disaster. When Managua, Nicaragua, was leveled by an earthquake in 1931, the Relief was in Panama. The field hospital was taken off her, loaded onto planes and flown to Managua where it proved invaluable in rescuing victims. Again, in 1933, when Long Beach, Calif., had its severe tremor, the field hospital was set up on shore and played an important part in the relief work. "Her reputation for skillful service is so great," Rear Admiral Lucius W. Johnson, (MC) USN, once reported, "that one day a wounded seal flopped up on the gangway. She was taken aboard and her lacerations carefully sutured. I am informed that she returned daily at 0845 for dressing until the wounds were healed . . . "
It was 20 years from the time the Relief was commissioned until the Navy got another hospital ship-the USS Solace, a heroine of Pearl Harbor and the South Pacific. She had been the old coastwise passenger liner, Iroquois. In the years that had passed between the time of the Relief's commissioning and the Solace's conversion, BuShips and BuMed had learned much about necessary improvements and additions to be made. As a result, the Solace featured many changes, including putting most wards above decks. She was commissioned on 9 Aug. 1941 and sailed almost immediately for Pearl Harbor. And that's where she was when the Japs struck on 7 December. Miraculously, she escaped damage and was able to do incredibly valiant and valuable rescue work that dark day. Since then, this game old girl of the Pacific has ministered to our wounded at many watery battlegrounds. She was in the Coral Sea when the great naval-air battle was fought and won there, and she stood off Guadalcanal's embattled beaches during the first U. S. offensive action of the Pacific War on that strategic island. 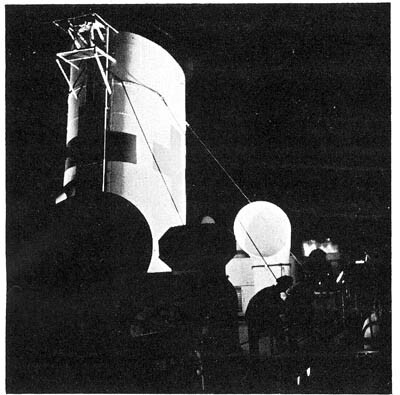 "During the eight months' period of greatest activity, the Solace, steamed over 50,000 miles and carried out 20 major evacuation missions. Of 10,000 patients received on board since the attack on Pearl Harbor, approximately 7,500 were war casualties. The number of deaths in this group was 16; 13 were surgical, 3 medical." "Hardly would a destroyer arrive in the same port, than some of its crew would appear with a bucket for our special strawberry or maple-walnut ice cream." And the bakery of a U. S. Navy hospital ship provided manna from heaven for the starving civilians of bomb-blasted Italian ports after Mussolini's fall. The bakers worked overtime turning out loaves and loaves. 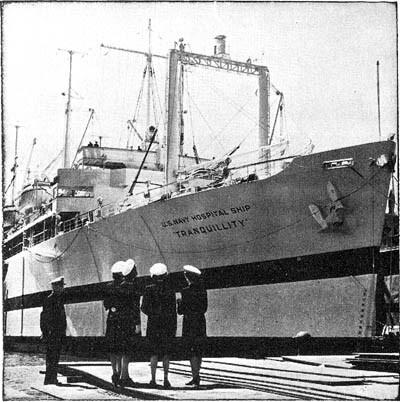 USS TRANQUILLITY is the first of new Haven class hospital ships, converted from Maritime Commission C-4 hulls. 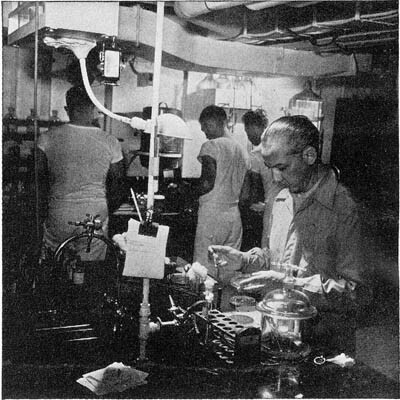 LABORATORY is a busy place on a hospital ship. Its equipment is complete, comparable to best shore labs. Solace and the Relief were our only hospital ships with the fleet. However, not long after the attack on Pearl Harbor, the Navy commissioned three new ones - the USS Bountiful, USS Samaritan and USS Refuge. A sixth, the USS Rescue, joined the fleet early this year after being converted from an auxiliary vessel. "On D-plus-1-day, I went aboard the Samaritan where Navy surgeons and the corpsmen were already dealing with the casualties from the day and night before." Assisting the Samaritan and other hospital ships at Iwo, the Secretary said, were "a number of our transports." "This was important," he added, "because of the fact that it facilitated speedier handling of the wounded from shore. That is to say, by having more than one ship available the small boats evacuating casualties from the island had various alternative ships that they could go to. By the time I had reached Hawaii a substantial number of the wounded had already reached the Naval Hospital at Aiea at Pearl Harbor. These were mostly cases of fractures, all of which had been set on the hospital ships at Iwo with the casts molded and full details of the injury and treatment on the outside of each cast. These patients were then, I believe, flown to Hawaii. It is a truly remarkable step forward in the handling of wounded." While LSTs were pressed into emergency use for transporting casualties in the European operations, it was at Iwo that LST (H) s made their debut-landing ship, tank, hospital. "The LSTs lay close inshore, and acted as 'screens' for the casualties brought from the beach. As boatloads of casualties came alongside, Navy doctors and pharmacist's mates classified the cases aboard, tagging each with a priority on medical attention. 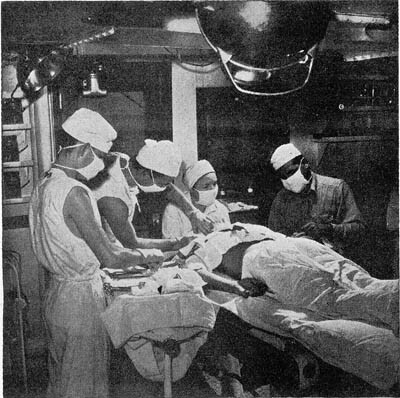 Serious cases were swung aboard the LSTs by a crane lowered through a hatch to the tank deck, where they were prepared for the operating room. The operating rooms were located in the former 'troop quarters' on the port side. Operating teams were using three tables and an assembly line technique to keep patients moving. Post-operative cases were cared for forward in the tank deck, until transported to hospital ships lying in the transport area." In some cases, the ambulances from shore evacuation stations can ride directly into the tank deck, through the bow doors. Stretchers bearing the wounded can be immediately removed and rested on litter brackets which are secured to the bulkheads the full length of the tank deck. Of course, these LST(H) "emergency wards" cannot compare in comfort and completeness with the six new hospital ships. These latter ships originally were built as U. S. Maritime Commission C-4 hulls by the Sun Shipbuilding and Dry Dock Co. of Chester, Pa. They are full conversions. They have a displacement of 15,000 tons. Their speed is 17½ knots with cruising radius of about 12,000 miles. Hospital beds are provided for 802 patients - 742 enlisted men and 60 officers. In an emergency, of course, the capacity can be increased by several hundred. In contrast, the older hospital ships accommodate from 450 to 760 patients each. For ship's company, there are accommodations for 58 officers, 30 nurses and two female Red Cross workers, 24 chief petty officers, 230 crewmen and 238 hospital corpsmen. The "nurses' country" is self-contained, with separate mess. For the corpsmen, 181 berths are on the second deck and 57 on the main deck for night detail. The hospital consists of two main operating rooms, fracture operating rooms, plaster room, apparatus room, anesthesia room, clinical laboratory, dispensary, dental clinic, dental prosthetic laboratory, radiographic room, endoscopic room, eye-ear-nose-throat clinic and eye-ear-nose-throat operating room. All medical rooms and wards are arranged so that there is access between them without going into the weather. The typical ward consists of two tiers of berths, which may also be used as single berths. Wider than usual ship berths, ward berths are detachable so that a patient may be handled if necessary without taking him from his berth. For further convenience of movement, the berths are accessible from both sides. At each berth, there is a portable comfort or utility light, which not only is available to the patient for reading but also may be used by doctors, nurses and corpsmen for examining a throat, applying a dressing, etc. NIGHT AND DAY hospital ships are clearly marked in accordance with Geneva Convention so enemy won't attack. 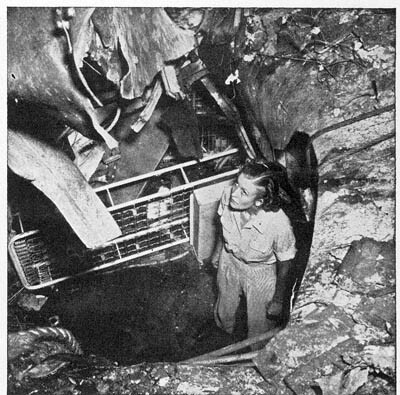 JAP SUICIDE plane hit the USS Comfort off Okinawa despite her Red Cross markings, killed 29 and wounded 33.
type Welin davits on each side forward so that power boats may be unloaded at the rail or on deck. The food - service plan has been adapted from successful hospital commissaries. Bed patients' food comes up from the galley to the main deck by food elevator and is distributed to ward diet pantries for service on individual trays. Vacuum food containers for solid and liquid foods are provided, with ingenious hand trucks for transporting them. The diet pantries are equipped with electrically heated tables and heated cabinets. Ambulatory patients will be served in the mess hall. Special diets will be prepared in a special diet kitchen under supervision of a nurse dietician. A "sharp freeze" compartment of 1,000 cubic feet has been included in the refrigerator compartment for quick-frozen foods. Two milk emulsifiers - "mechanical cows" - each with 40-gallon-an-hour capacity have been installed. Ice cream capacity and storage have been increased to a point adequate for frequent serving. Recreational facilities are greater than ever. Each bed or berth in the wards has ear phones or pillow phones hooked into a five-channel entertainment broadcast system which will provide long-wave and short-wave radio programs, picked up by a master receiving set, and phonographic music. The wide, open bridge deck will be available for movies, shows, deck sports and sun bathing. The main deck lobbies, fore and aft, are fitted with chairs and tables to serve as lounges. A patients' library is provided on the main deck off the lobby. Two Navy chaplains and two Red Cross workers are aboard. Supposedly, hospital ships are immune from attack. They are always painted white with a wide green band painted around the hull and large Red Crosses marking them for easy identification. At night, they are fully lighted. All this was decided upon at the Hague Convention of 1907 when the immunity of hospital ships was agreed to by representatives of many nations. However, in both World War I and World War II, hospital ships have been hit. In addition to the hospital fleet, the Navy has three ships, the USS Pinkney, USS Rixey, and USS Tryon, which are classed as hospital transports. Actually combat ships, they are fitted to evacuate wounded from battle zones to rear echelon hospitals. They are armed, painted with war paint and have no immunity from attack but like the hospital ships they play a vital role saving American lives. The Army, too, has a hospital fleet. By the end of summer it will total 29 vessels, including three manned by Navy crews but staffed with Army medical personnel under Army command. The others are manned by civilian crews of the U. S. merchant marine in the employ of the Army Transportation Corps. 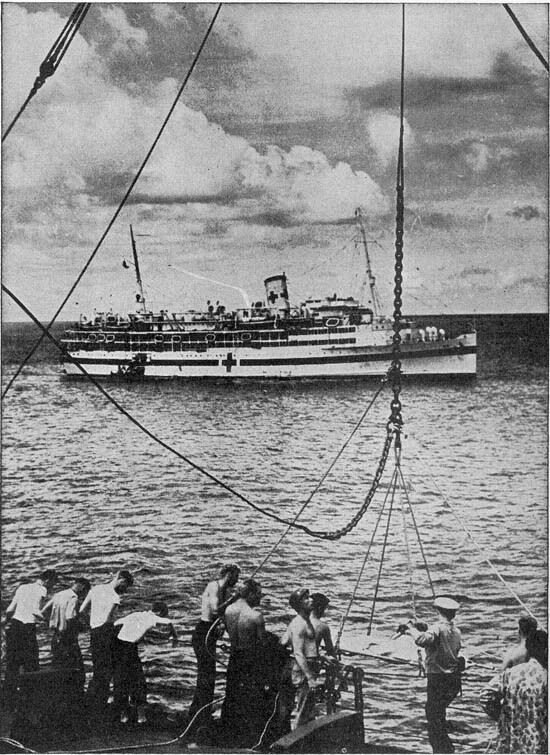 The Army uses hospital ships primarily for evacuation of wounded, although for limited periods they may become emergency hospitals. For instance, during the invasion of southern France 12 of them lay off the coast and served as emergency hospitals until orders sent them, laden with casualties, to hospitals in North Africa and England. Similarly, Army hospital ships stood off the beachheads of Anzio, Salerno and Sicily. Many of the Army ships are also used in shuttle service. They lie at anchor off an invasion beach taking on casualties and, when loaded, debark for a port of safety where hospital facilities are available on land. After unloading, they head back for the battle scene to go through it all again. The USAHS Seminole has been one of the busiest in this shuttle service. In 10 months' time in the Mediterranean, she transported 10,000 patients from battle beaches to rear-echelon hospitals. She made four trips in five days between Anzio and Naples. On one of these trips it was necessary to sail without a full load because the Germans were shelling the harbor. "Flagship" of the Army fleet is the USAHS Acadia. She participated in or stood by for every invasion in the European theater - North Africa, Sicily, Italy, Normandy and southern France. At North Africa, she was a troop transport; at the others, a hospital ship. Most of the Army hospital ships right now are transporting wounded men from Europe to the U. S. When that job is done, many of them will be shifted to the Pacific. Largest and fastest of the Army's hospital fleet is the Frances Y. Slanger, the former Italian luxury liner Saturnia, only recently taken over for hospital duties. With twice the capacity of the previous largest hospital ship, the Slanger has facilities for 1,776 patients including 89 wards, three operating rooms and facilities for recreational activities by ambulatory patients. She also has a chapel, library and reading room.